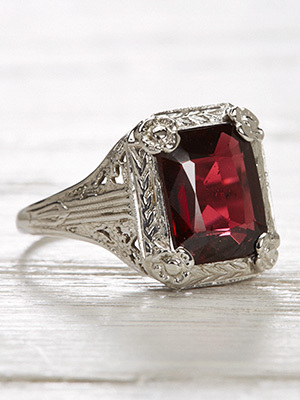 Delicate floral blossoms temper the passion in this vintage garnet ring. 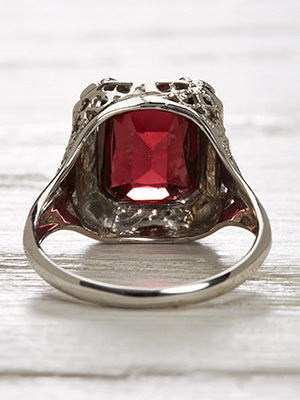 The almandine garnet at the center blushes red as the reddest rose. The octagonal mounting features four metallic rosettes at its corners. The filigreeing that highlights the band of this vintage ring is threaded down the shoulders with a trio of mill grain streamers. Details: Vintage. Circa 1930s. 18k white gold. Emerald faceted mixed cut garnet; 2.74 carats. 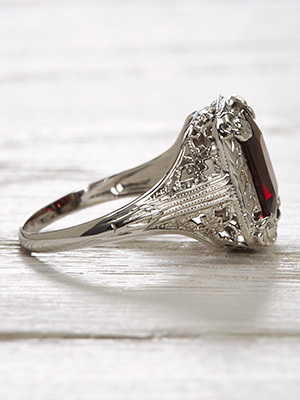 Special characteristics This vintage ring features a floral and filigree mounting in 18k white gold. 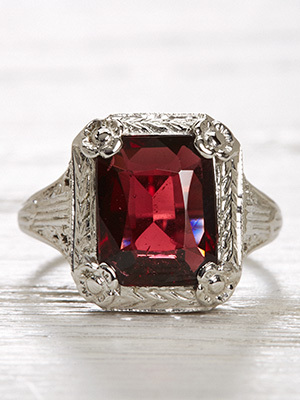 A 2.74 carat almandite garnet is set with 4 rosette prongs.